Today we are happy to publish our joint submission to the Financial Stability Board’s Task Force on Climate-related Financial Disclosures (TCFD), in collaboration with our research partners at the Sustainable Finance Programme at the University of Oxford’s Smith School of Enterprise and the Environment (‘Oxford Smith School’) . 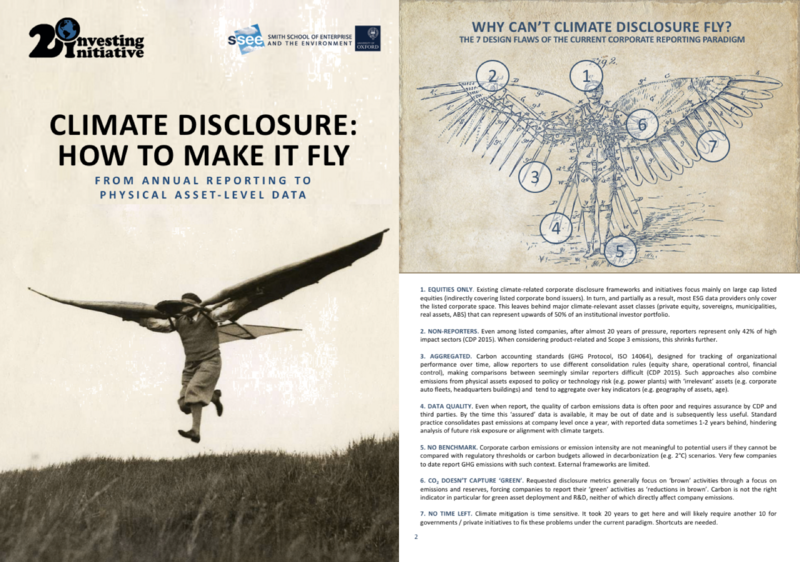 The report, “Climate Disclosure: How to Make It Fly” suggests that existing asset-level information, that is widely available but in disparate locations, be brought together in ways that can complement existing voluntary disclosure pathways. In this new report, we point out that the existing corporate disclosure model has some inherent weaknesses including a backward-looking nature, the aggregation of activities and geographies, large gaps in reporting, and a limitation to the listed equity space. Asset-level data overcome these weaknesses, allowing investors to assess the future alignment of their holdings with global climate objectives and to assess potential associated financial risk with high levels of activity and geographical detail. 2DII and Oxford Smith School believe that there will never be perfect reporting globally, whether voluntary or mandatory. Thus, we need to develop proposals that recognise this fact and respond accordingly. Fortunately, our ability to know, for many key climate-relevant sectors, what assets companies own, what assets they invest in, the exposure of these assets to risk, and their environmental impact, is so much better today than it was even a couple of years ago. We believe the Task Force should support efforts to make comparable asset-level information available for key users across all sectors and geographies. As always, we welcome your feedback. Please get in touch with us if you would like to start the conversation or have questions / thoughts on our work that you would like to share with us.